Share options: Display social share icons and the video URL after the video finishes playing. You also have the option to add a background image to your video’s end screen. Custom image: Display an image after the video finishes playing. You also have the option to make the custom image a clickable link. Call to action (CTA): Display a button with a custom link to seamlessly direct viewers straight to your site, product page, or anywhere else on the Internet. You also have the option to add a title, description, additional custom URL, and background image to your video’s end screen. The title in the CTA end screen will be hidden when the player is smaller than 360px wide and 203px tall. Email capture (Business and Premium only): Display an email capture screen at the end of your video, with the option to add a custom message. Please note that if you’ve already set up email capture for before or during your video, this end screen option will not be available. Learn more about email capture. The custom message in email capture screen will be hidden when the player is smaller than 200px tall. 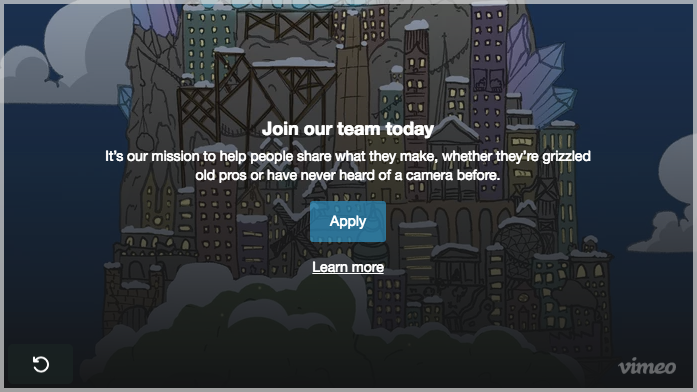 Vimeo Business and Vimeo Premium members can also track the performance of the CTA end screen or email capture end screen of a video from its stats panel. Learn more about stats for video interaction tools. Thumbnail: This video will return to the beginning thumbnail after it finishes playing. Empty: Your video will not show anything after it finishes playing. Loop: Your video will loop after it finishes playing, infinitely. Except for the Thumbnail and Loop options, there is a replay button in the bottom left corner of every end screen. All the options listed above can be found by navigating to your video's settings > Interaction tools > After video. Open the End screen drop-down menu to choose your end screen.